PROJECT 2∙6∙8, a charity networking organization, raises awareness and funds for multiple charitable causes within the host community while promoting the colors of all causes…. 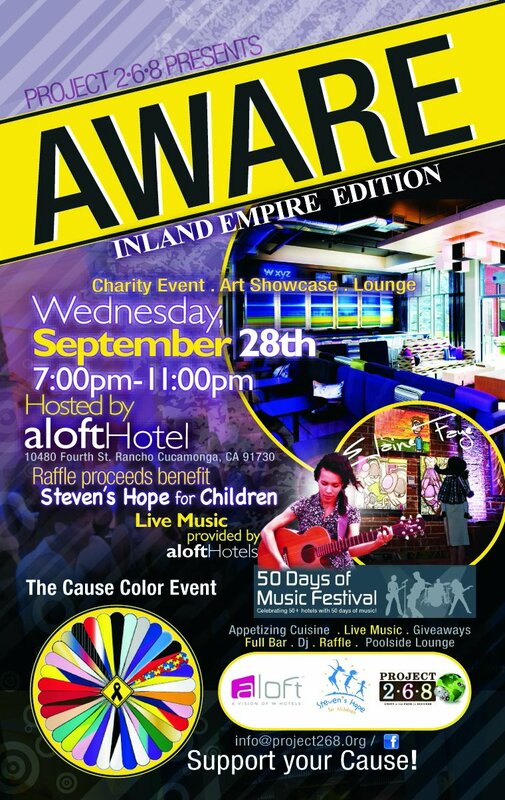 This season’s AWARE (I.E) event, hosted at the Aloft Hotel in Rancho Cucamonga, is aimed at raising much-needed funds for multiple charitable causes while increasing the visibility of our featured charitable organization, Steven’s Hope for Children, and local business sponsors. Guests will luxuriate in a vivacious atmosphere of chic rooms and a poolside patio while enjoying the sounds of trendy music, the displayed work of local artists, a fully stocked bar, an appetizing cuisine, raffle prizes, and many more. PROJECT 2∙6∙8 has realized the gap between the things people want to do and the things people are doing. We are mindful that there are many health and social issues that lack attention and underfunded charitable organizations that need exposure through networking avenues. I will be there with my largest client Eugene Panis Author of “The Circle:Vision Quest” and Art Sculpture of Gem Trees By Eugene Panis. Eugene will have 3 trees on display for the art show with an additional tree donated as a raffle prize. http://www.facebook.com/event.php?eid=140075902752150 – Click this link for the Face Book invitation, use the constant contact link to register for the event.